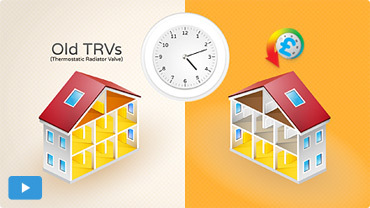 Wireless thermostatic radiator valves (TRVs) capable of reducing energy consumption by 20 to 30% could very well be the best solutions to help universities reduce their energy use and achieve their emissions targets. This goal is especially important since, despite progress being made to tackle carbon emissions in the higher education sector, universities are still struggling to achieve collective 2020 reduction pledges, according to the latest Brite Green Higher Education Sector Carbon Progress Report. Out of the Russel Group Universities (which represent 50% of overall UK university emissions), the University of Birmingham achieved a 24% decrease in emissions whilst King’s College London saw a substantial 21% increase in carbon emissions since 2005. The largest overall increase in emissions came from the Trinity Laban Conservatoire of Music and Dance, which has seen a 133% increase. In order to meet the specific requirements set in the educational segment, Universities will certainly require very effective energy management systems to be put in place, and that’s exactly where the HeatSave programmable wireless thermostatic valves can really come in handy.